Hi, I am interested in your 1979 Pontiac Firebird (stock #4962-CHA) listed on Autotrader for $36,995. I'd like to get more information about this vehicle and confirm its availability. Properly restored, correctly documented, original where it counts, and filled with desirable features (T-tops, four-speed, etc.) 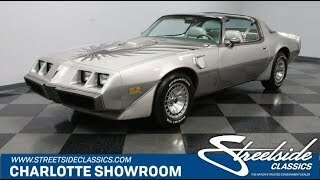 this 1979 Pontiac Firebird Trans Am 10th Anniversary Edition is a collector car presented exactly how you want it. Someone has made some significant investments in this T/A. These anniversary cars were given a special color called Platinum Silver, and the way this radiates in the sunlight really lets you know this is a collector-grade Pontiac. All the details continue to showcase this cars value. Leading the way is a special version of the screaming hood bird thats exclusive to these cars. Its wider than normal, and it helps set up the darker silver accent color that runs from the shaker hood, around the doors, and ends at the pinstripe behind the T-tops. Speaking of the pinstripe, this red and black dual line was part of the restoration. Its an expensive undertaking, but worth it considering they outline just about every detail on this coupe - including the wide wheel well flares, fender vents, and full-width rear spoiler that make this generation T/A look like it owns the road. Pontiac fans know that no true 10th anniversary model is complete without the Turbo alloy wheels. These were their debut and exclusive to the limited run of 7,500 10th anniversary cars in 1979. Inside, the silver leather interior is a standout hallmark of this special edition car, so its good to see a quality investment to keep it looking so correct. You even have the black and red pinstripe and Firebird logo stitched into the doors! Thats why youll be especially happy to take out the glass T-tops and share this full uniform package with the world. And when you do, you get to feel as cool as you look thanks to R134a air conditioning. In fact, this comes loaded with all the best features, including power windows, power locks, and power steering. The original AM/FM stereo with 8-track is still even on display. But you get modern driving tunes thanks to the CD stereo with USB and Bluetooth mounted just below it. The driver gets a leather-wrapped three-spoke steering wheel, and beyond that, the dash is covered in the T/As hallmark machine-turned aluminum panel. The original gauge pack specially glows red like an aircraft, and even the factory tach/clock combo is still in working order. So this offers that unmistakable enjoyment that comes from a complete and vintage sports car. The 400 cubic-inch V8 is believed to be the original motor to the coupe. You can tell they spent time and money here making sure it presents just as nicely as the rest of the car. You see it everything from the correct decals to the pliable rubber seal around the shaker hood element. Topped with a four-barrel carburetor, this V8 develops plenty of torque, and the quad-tip exhaust has plenty of bass. This was born a desirable WS6 car. That means a terrific handling package that was the envy of its day. It includes sway bars front & rear as well as four-wheel disc brakes. Plus, with a recent investment in the front in it still feels tight on the road today. And the control of the four-speed manual transmission and a new clutch means this classic muscle machine is a blast to enjoy right now. The sale come complete with the right paperwork, including the factory buildsheet, reproduction window sticker, original warranty card, bill of sale, owners manual, and maintenance records. So you know youre looking at a cut-above rare classic. Dont miss your chance, call today!